Add natural beauty to your fairy garden with miniature air plants! These plants don't need soil to grow, so they can flourish in many different environments. Additionally, they require only a moderate amount of light and only need watering about once a week, making them the lowest-maintenance plants available! We recommend keeping air plants in an area where they receive a moderate amount of light. Indirect sunlight and artificial home/office lighting are appropriate for these plants. It's generally safe to keep air plants in direct sunlight for a short period of time each day, but we recommend misting them with water every 2 hours or so to keep them from drying out. The optimal way to water air plants is to soak them in water for 2 hours once per week. If you find the leaves of your air plants are becoming soft or pale in color, this means the plant is too dry, and you should try misting or watering them more often. 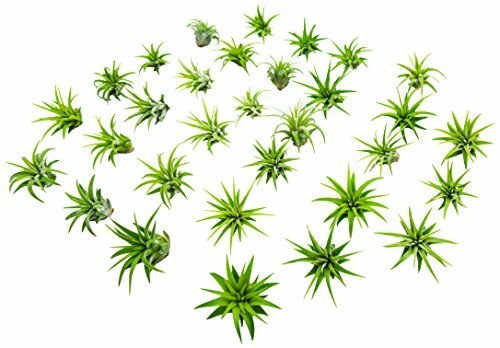 ENCHANTED FAIRY GARDEN PLANTS: These live mini Air Plants are perfect for ornamental fairy garden design. The possibilities are limited only by your imagination! ECO FRIENDLY: Many Tillandsias are becoming endangered in the wild due to over collection. To protect these threatened resources, all of our air plants are greenhouse grown and never wild collected.